On the western wall to the left of the main door to the church. 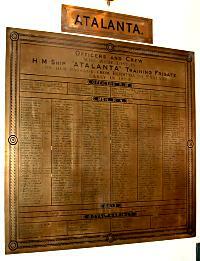 "HMS Atalanta was a training ship, previously known as HMS Juno and launched at Pembroke Dock in 1844. She had seen service in the Pacific before becoming a virtual hulk and the headquarters of the Portsmouth Dockyard police until permanent accommodation was found for them on the site of the original Commissioners house. Following the loss of the Eurydice, Juno was towed back to Pembroke and converted to provide suitable accommodation for ordinary seamen under instruction. Despite superstitious forebodings among many seamen, she was renamed HMS Atalanta and commissioned at Devonport on 17 September 1878. Her officers, under Captain Francis Stirling, were said to be both experienced and competent so there was no immediate concern when she was overdue. It was known that she had reached Bermuda on 29 January and that since it was rumoured that she may have been carrying cases of Yellow Fever, which had been rampant in her former port of call, it was understandable that she had not been welcome and had set sail two days later. However by the end of April concerns were being widely expressed and hopes that a storm had dismasted her leaving her drifting helplessly in mid-Atlantic could no longer be believed. Since a Committee of Enquiry could not call witnesses, its terms of reference were limited to inquiring into the seaworthiness of the ship. The public were not slow to draw comparisons with the loss of the Eurydice, especially as it too, had recently undergone a re-fit. It was left to The Times to disclose, in December 1880, that nine ships of Her Majesty's navy had sunk without trace since 1840 and that five of these had been designed by Sir William Symonds. The Committee could come to no conclusions as to the cause of the loss - but then, they had not been asked to do so! (The Chairman of the Committee)....had been Admiral Alfred Ryder who was also responsible for placing the first window on the South side of the church nearest the altar in memory of his brother and nephew..."
A second window on the south side of the church commemorates Admiral Ryder himself.